24-hour forecast: Cloudy today and tonight with the possibility of light rain today and isolated showers tonight, mainly along the coast. Winds: North to northwest at 10 to 20kts with occnl higher gusts. Today: Winds: W/NW 10-20 kt with higher gusts. ; seas:Moderate - rough; waves: 4-6 ft.; possibility of light rain exist. Tomorrow: Winds: N/NE 5-15 kt; seas: Choppy . ; waves: 3-5ft. ; isolated showers. Marine Outlook: Wednesday night:- Winds: E/NE 5-15 kt. ; seas: Choppy. ; waves: 1-3 ft.; isolated showers. General Outlook: For Wed and Wed night: Partly cloudy with isolated showers. Last edited by Marty; 03/19/14 05:00 AM. It's a cool morning on Ambergris Caye but with an expected high of 81. The wind is NW at 10 mph. No rain showing on the Radar this morning. . .. .Generally Overcast conditions for much of the day due to the cool weather clouds I expect. 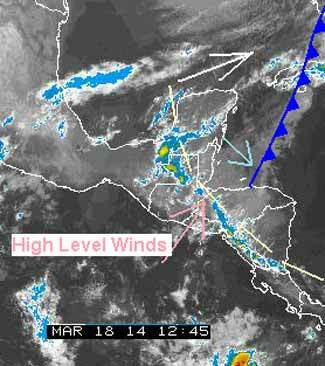 That line of high level clouds, ( Yellow line ), that originated from the ITCZ activity down n the Pacific near Panama, will probably not cause any rain, but may help to keep the low cloud in place. We had very strong winds in Santa Elena yesterday. Strong enough to blow a neighbour's unsecured (I assume unsecured) tin roof off! It looked like a snow storm/white out, but with leaves and dust. That strong wind you refer to would have been caused by a nearby Rain Storm cell. .. .They can sometimes approach even hurricane force winds briefly, and can be from any direction. . . . .Due to the vertical movement of air in a storm cell. We don't have Tornadoes, but some of those storm cells can produce almost Tornado type winds for s short time. We did have one in Crookedtree village a few years ago, and I have seen a Waterspout, lasting for perhaps 20 minutes. I strongly suggest that roofs not be Nailed on, but Screwed on. there was some kind of mini-tornado in cayo in 1991 or 92. we were living on maya ranch then, mile 4.5 pine ridge rd. i was alone in the main house - and it took every piece of roofing (nailed not screwed) off of the guest house close to me, whirled trees around until they were felled on every side of me. the main house had a wrap around veranda, covered by main roof. all of the support 4 x 4's holding up the roof along the edge of the veranda were pulled out of their holes and set next to the holes on the veranda. with a little more wind we surmised that the entire roof structure, not just roofing, would have gone flying. that roof was screwed on. john used jacks to hike up the entire roof up again to put them back into the holes. close by in upper barton creek, it not only took down giant trees but it put a buggy up into a friend's roof - leaving it hanging there by the hames stuck in the thatch. it also had done some damage in spanish lookout before jumping south to the maya ranch/barton creek area. was it a tornado or not, i don't know but it sure caused a lot of havoc. when i saw all the torn metal roofing (all blown into the same area west of the main house) i was thankful my guardian angel had been on duty that afternoon. it happened in the towards the end of the dry season and was not accompanied by rain. you are right though - all roofs should be screwed on for sure. and large trees should not be planted too close to structures, even though the shade can be glorious.